Filtration is a key element to mostly every clear and healthy pond. When choosing a filter, it's best to decide based on pond size and fish load. Ponds with heavy fish loads will obviously have more debris, so with those ponds you will want to consider oversizing filtration. Remember, you can never have too much. Choosing the proper filter is dependent on many things – pond and pump size, fish load, hours of sunlight, environment, percentage of plants, etc. 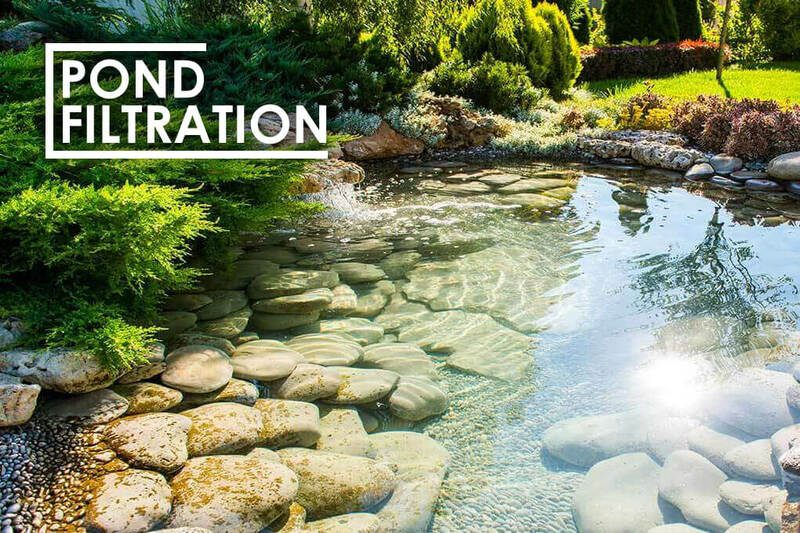 I know it's a lot and it can be confusing, but there are basically only 3 styles of filtration – submersible (in-pond), gravity fed, and pressurized. Along with primarily two types: mechanical and biological. Mechanical being the physical trapping of debris, primarily through filter pads and mats. Biological is often used with molded plastic bio-media (bio-balls) or lava rock/gravel. These materials often have tons of surface area where beneficial bacteria can colonize. Gravity Fed Filters: These are some of the most cost effective and low maintenance systems available. Water from the pond is pumped into an inlet of the filter using either a submersible or external pump. The water then fills the filter, flows through and overflows from a spillway and eventually returning to the pond via gravity. Because of this, the filter must be elevated above the surface of the pond. They are usually installed at the top of a waterfall. Filter media often used is plastic bio-balls. The bio-balls house beneficial bacteria which help convert toxic ammonia and nitrites into nitrates, to be used by plants. Filter pads can also be added for additional mechanical filtration. Pressurized Filters: With a pressurized filter, the water is pumped into an inlet similar to a gravity fed filter. But, unlike a gravity fed filter, the water leaving a pressurized filter remains under pressure on exit. This means that the filter does not have to be elevated above the pond, and some can actually be buried for better concealment. Most are extremely low maintenance with backwash capabilities, so you don't have to open them. Some even come with integrated UV clarifiers. Filter media usually found inside is plastic bio-media, foam or both. Submersible Filters:Very small ponds will usually utilize submersible filters since heavy fish loads and large waterfalls are not present. These in-pond filters are generally mechanical and often consist of foam, polyester or carbon pads contained inside a housing with pump. With mechanical filtration generally comes more maintenance since its primary job is the physical removal of particles and debris. Most submersible filters include fountain head attachments for a decorative look. 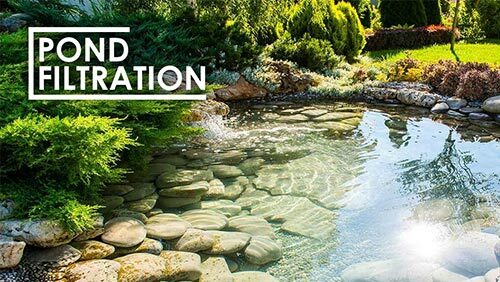 Whether looking to upgrade your existing filtration system or starting from scratch in a new pond, a properly sized filtration system will ultimately improve not only water quality but also clarity, and is a great investment in your pond.